So what about the sticky and blue? I use a lot of fusible products and I try as many as I can find and afford. The favorite is paper backed, because I can draw my design and then transfer to fabric, with very little waste of either. I love Misty Fuse because it stays soft and retains a beautiful drape. Since Misty Fuse is just a web, getting the exact result is more difficult, because you need another way to transfer the marked lines/design to Misty Fuse, which can add another step to the process. Last year I tried Barely There (the review) and in the store here. The few small things I tried it on worked out for the most part. Except for the occasion, where I forgot to use the correct heat setting on the iron. Oops! I used both Barely There and Misty Fuse on the ‘chicken’ quilt. Barely There for the construction of the chickens and egg flowers. While stitching down the chickens, I discovered some loose pieces. Not completely coming off, but enough that things could have shifted. So a bit more testing was in order. I was afraid that I may have made an error when I decided that I liked Barely There! What could possibly make a fusible not stick well? The only thing, if all else was done correctly; the proper iron temperature and setting (made that mistake with the gecko) and/or the correct amount of pressing time would be the fabric. What could be wrong with the fabric? With fabric, the manufacturers finish or starch will keep a fusible from adhering well. So I prewashed the fabrics for this piece. Then I printed the pattern on to the Barely There, fused them to fabrics and proceeded. Verdict? Much better stick! Stick was very important in this case because this piece is raw edge applique using regular quilting cotton, not batiks which have a finer thread and tighter weave. Regular ‘quilting’ cotton tend to have a thick thread and looser weave, making them susceptible to fraying. By prewashing the fabric good stick was achieved and with less fraying on all fabrics! So what about the blue part of the sticky and blue? For the quilting, I drew a grid with a blue washout marker. Getting rid of the grid after quilting these days is the real problem, especially if you don’t always prewash your fabrics, (ask me how I know about this too). I have been sewing and quilting long enough that I remember the marks coming out fairly well with just a spritz if only one layer, and maybe a good wetting if more than one layer, (top, batting, backing). But here lately, you might actually have to submerge a project to get the blue out. I have used just about every product made to remove the blue, and none of them seemed to work any better than water if they did anything at all. But while surfing, reading blogs and posts on the Internet, Facebook or Instagram, one day- I ran across a tip. Wish I could remember from where and give the kudos and credit and link directly to their page, but I can’t. (edit- I found it!) For the story from the tipper go to www.piecenquilt.blogspot.com I even tried a search and a look back through daily history. But no such luck. If you know who…please tell me, I’ll add it! Mix 1 teaspoon of baking soda with 1 cup cold water. Mix well and place in a spray bottle. And then proceed as normal. All the blue came out, no resprays or touch-ups. I left a corner and as you can see, it was a rather thickish line. I used the Mark-B-Gone from Dritz, it makes a thick line but marks fast and for a simple grid, it works great! Going to keep a spray bottle with soda water in it. I suppose a flat bottle , (as in no bubbles), of soda water would work too, now that I think about it! Have you had difficulty getting the blue out? Do you have another method that works well? Please share in the comments if you do!!! Between daily life and pulling the new ihaveanotion.com web pages together I did do a little creative playtime. Not much… but some. In March I shared my “Thread Talk” and some of the quilts I’ve made that have lots of thread on them with a guild in Indiana. They asked if I would come back and share a “Thread Workshop”. They chose a ‘threadpainting’ technique. Its a great class for beginning thread work and free motion work, especially if you have been afraid to do either. Most of the decisions are made for you…. and you only have to workout a few color decisions and play. The play date was in early July and there were 19 ladies waiting to play!!! We had a really fun day with thread and flowers! Whenever I share a technique I try to have at least one new piece and one new sample to show how I work the stitching. The new piece was these Daffodils. Sorry I don’t have a detail shot of the stitching. I was really more interested in getting to the quilting part, because I wanted to play with an idea for another quilt. The other new piece I started for the class was one that I left in mid stitching stage. To illustrate how some thread decisions are made, demo the stitching and to show how I use the batting as a stabilizer. also got a label done for it. 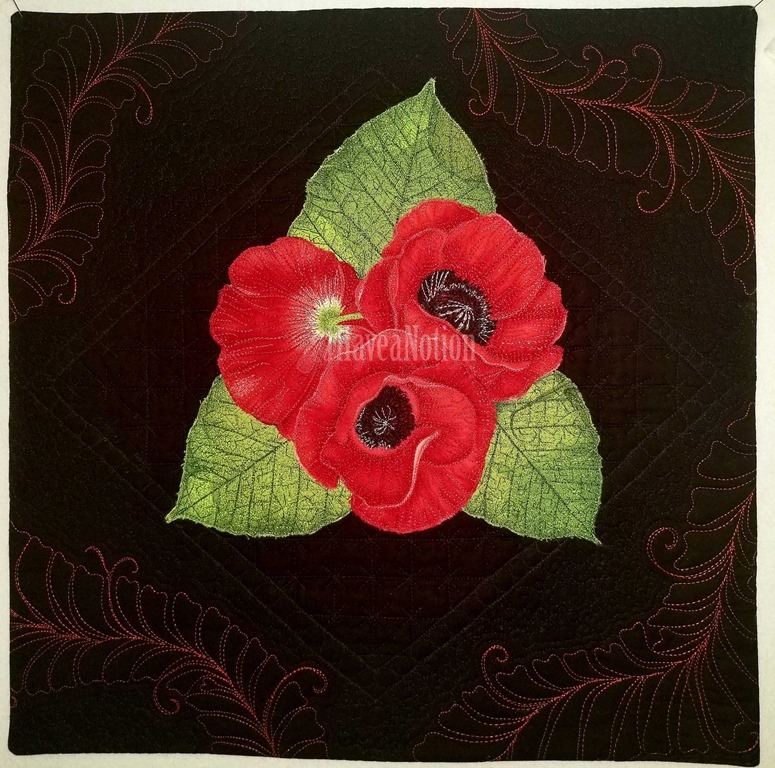 About 20” square and the red quilting was done free motion with Glide 40 weight thread, the black quilting was done with a 50 weight 100% cotton. I was sent a picture (I always forget to take pictures) from the guild meeting after the workshop and 4 ladies finished their little piece. It is so rewarding to see finishes, but I also relate to the participants that finishing is not a requirement, sometimes in playing we make decisions… that don’t resonate… and compel a finish. I have several of those!!! Let me also thank everyone for the visits to the store, reading the blog and leaving comments. I really appreciate them… without you there wouldn’t be any fun.